Way back in the beginning of the year, I stated it was my goal to make math more FUN. I haven't forgotten that goal. I'm not sure that my nine year old thinks math is "fun", but she doesn't think it's the drudgery it used to be. My six year old can't get enough of math. He has a brain for numbers and is obsessed with time, money - it's great, but it kind of drives his sister crazy! I'm also discovering I have two very different learners. My son learns by hearing something and this is just about enough for him. My daughter has to have more repetition/drill and also enjoys working with her hands. Homeschooling is awesome because it allows me to tailor math to their specific learning style. We have almost mastered the times tables through 12. I have a couple of resources and games which have really helped that I'd like to share. If you have something that works for your children, please leave me a comment and tell me about it! 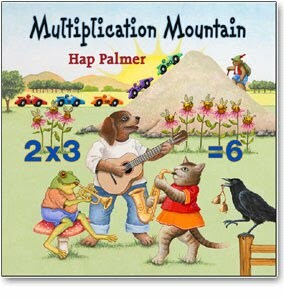 Multiplication Mountain CD by Hap Palmer -- the times tables set to music. When my little guy recalls his multiplication facts he sings them to me. I'm not kidding. All it took was a week of listening to this in the van and he had it. This is obviously the way he learns. Multiplication Wrap-Ups - we used these for addition and subtraction. My daughter likes these because she loves to work with her hands. This is obviously the way she learns. Egg carton game for math facts -- I got this idea from a Mathtacular video that came with some Sonlight curriculum. The whole video is great and has lots of ideas that are easy to implement. Here's how you play: get an empty egg carton and number the compartments with the numbers 1-12 with a Sharpie. Put two beans or counters (we used marbles) in the carton and SHAKE! Open the carton and whatever two numbers your counters rest in determines your math fact. For example -- counters land in 11 and 10, my kids say "11 times 10 is 110". You can use this for addition and subtraction, too. They REALLY liked this game. Coloring 100s charts with whatever multiples you want your child to learn - print some 100s charts from this site and have your child color accordingly. It seems that 7s and 12s are tough for us, so I've had the kids color in the multiples of those so they can see the patterns. For example, your child would color 7,14,21,28,35, etc.... all the way up to 84 on their 100s chart and then see if there is a pattern that emerges. I know there is a school of thought that says don't worry about drilling, but I am in charge of my kids' education and I know they will know it if I drill them and drill them daily. Mean momma, right? That's it for multiplication? Thoughts? Comments? I'd love to hear from you! I am participating in a blog hop today over at ABC & 123 Learning Cooperative. Looks like there are some great ideas, so check them out! 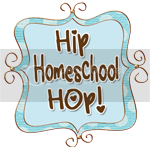 And, as always, I'm linking to the wonderful Hip Homeschool Hop!